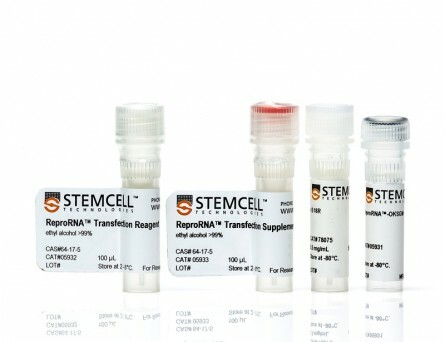 ReproTeSR™ (2-Component) is a complete and xeno-free reprogramming medium developed for generating human induced pluripotent stem (iPS) cells from fibroblasts, urine-derived cells, and blood-derived cells such as CD34+ or erythroid precursor cells under feeder-free conditions. 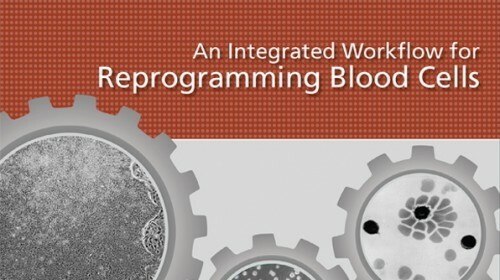 ReproTeSR™ is also available as part of an integrated set of tools that are optimized for reprogramming blood-derived cell types expanded in vitro from peripheral blood, such as CD34+ cells (CD34+ Progenitor Reprogramming Kit, Catalog #05925) or erythroid cells (Erythroid Progenitor Reprogramming Kit, Catalog #05924). 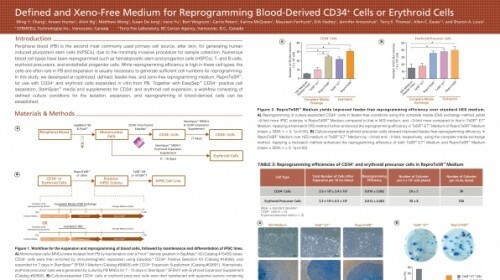 Efficiency of reprogramming (A) erythroid cells or (B) CD34+ cells using episomal reprogramming vectors is higher in ReproTeSR™ medium compared to in KOSR-containing hESC medium. 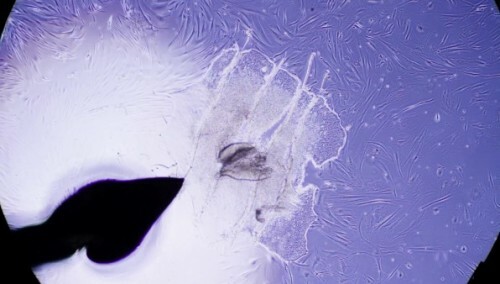 Data shown are mean /- SEM; erythroid cells, n=4; CD34 cells, n=5. 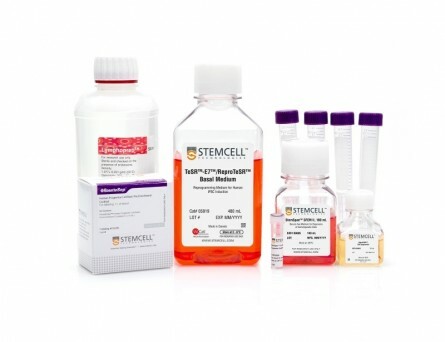 Dermal fibroblasts were transfected with the ReproRNA™-OKSGM vector and reprogrammed under feeder-dependent (standard KOSR-containing hES cell medium on inactivated mouse embryonic fibroblasts (iMEFs)) or feeder-independent conditions (ReproTeSR™ on Corning® Matrigel®). 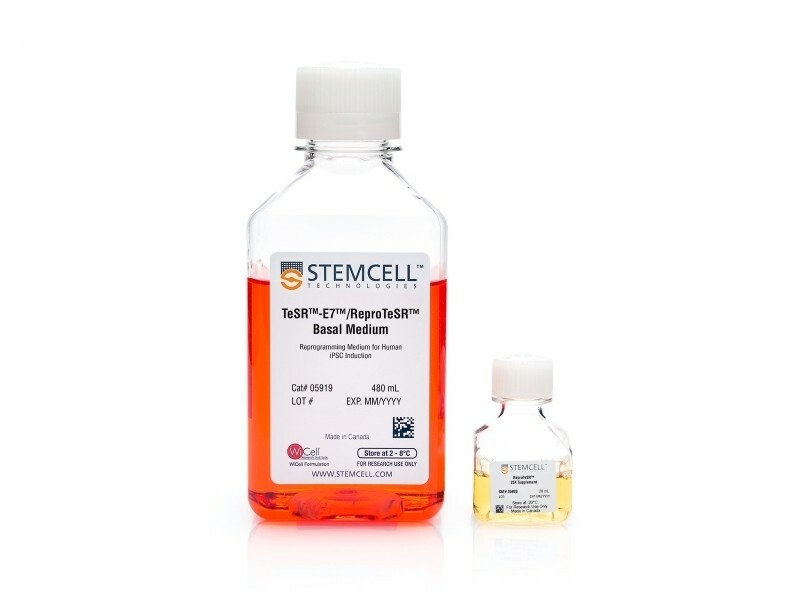 Fibroblasts (passage 4) were reprogrammed with average efficiencies of 0.10 ± 0.06% (hES cell medium) and 0.20 ± 0.07% (ReproTeSR™). 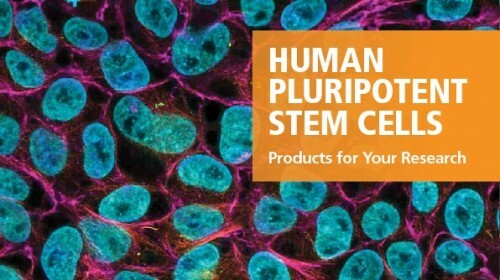 Reprogramming efficiency of fibroblasts with ReproRNA™ and ReproTeSR™ is comparable to that reported with Sendai virus. 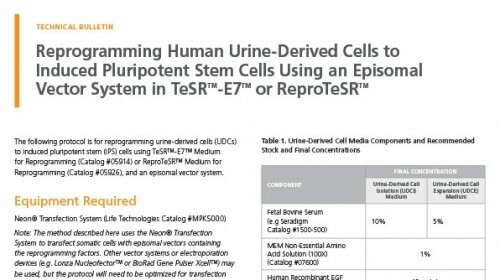 (Schlaeger TM, et al. 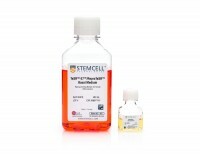 (2015) Nat Biotechnol 33(1): 58-63.) (n ≥ 6; Data shown are mean ± SD). 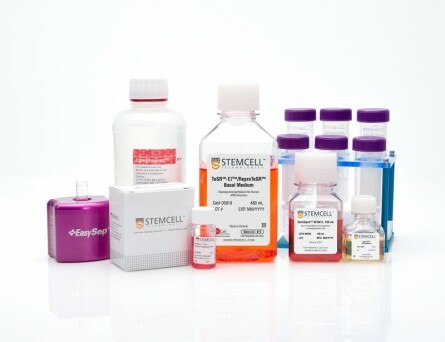 Representative images of iPS cell colonies were generated using ReproRNA™‑OKSGM and cultured in (A) standard hES cell medium on irradiated mouse embryonic fibroblasts (iMEFs) or (B) ReproTeSR™ on Corning® Matrigel®. 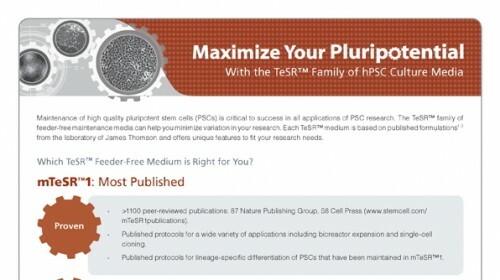 iPS cell colonies derived using ReproTeSR™ exhibit more defined borders, compact morphology, and reduced differentiation as compared to the ES cell medium.